Among the first families to settle in the Sauk River Valley in the area today known as Cold Spring, Minnesota, were the Fuchs, Hansen, Jacoby, Kirsch, Maselter and the Theis families. 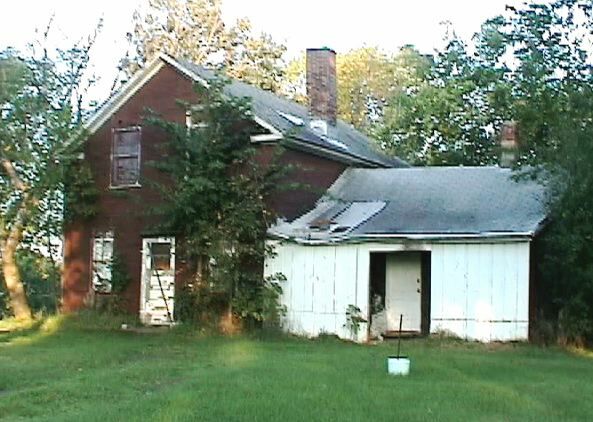 Herbert Theis, great grandson to Nicholas and Elizabeth Theis, was still living in the original family farm house built in 1864 when this story was researched in December of 2004. Through the years, Herbert Theis has always enjoyed telling stories about the early days of Cold Spring. From elementary kids, to local seniors, Herb took great pride in telling his family stories about the pioneers who brought their families to settle here. 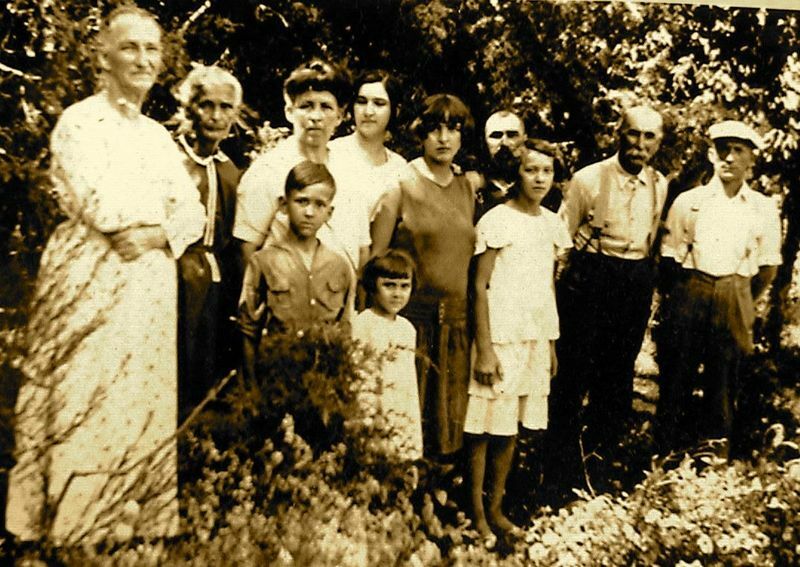 It was 1855, a year before the first dam and sawmill were built on the Sauk River in Cold Spring, when Herb's great grandparents Nicholas and Elizabeth Theis left their home in Bollendorf, Germany to come to America. They left Germany in search of religious freedom and to avoid enlistment in the Prussian Army. They were drawn to Cold Spring following the glowing recommendations of Father Pierz, a missionary to the Native Americans of the area. The Theis family took up residence on the east shore of the Sauk River, just a few blocks south of the present-day Cold Spring water tower on Highway 23. 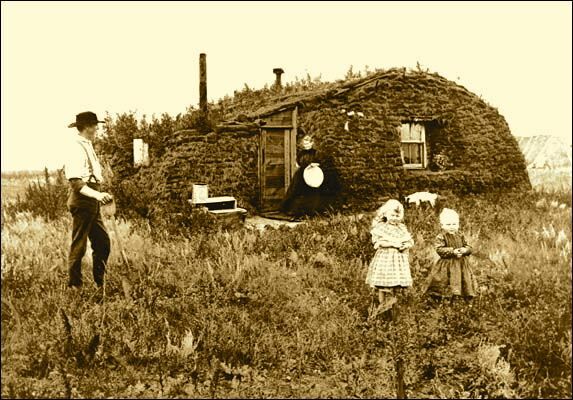 They quickly built a sod house to protect themselves from the rain and snow. Herb's Great-Grandma Elizabeth kept her umbrella handy any time it rained to shed the water that leaked through the roof from dripping on the baby crib. The area was mostly woods and a nearby spring. Each day water had to be carried from the spring to the house using buckets attached to a yoke. The new settlers were in close proximity with the Native Americans who lived just to the north along the river. (across the river from Frogtown Park) Elizabeth Theis had many encounters with the local Native Americans who would show up at her door step asking for flour. She obliged by filling their birch bark bowls with flour. Later, the Native Americans brought deer meat to Great-Grandma to show their appreciation. On one occasion, a Native American mother showed up with her baby who appeared to be sick. The Native American mother left the baby to be cared for. Great-Grandma guessed that the child might be hungry so she warmed some milk and bread to feed the baby. Several days later the Native American mother returned to find her baby was doing much better. Great-grandmother was given a handful of deer meat in return for helping the sick child. A new five-bedroom, framed house was built on the homestead by John Theis, son of Nicholas and Elizabeth, in 1864. The home, which still stands today on the hill overlooking the Sauk River and the City of Cold Spring, was built at a cost of $180 for the lumber. Following the grasshopper plagues of the 1870's, a chapel was constructed on a hill just northeast from the Theis homestead, land donated by the Maselter family. The Grasshopper Chapel became a pilgrimage for people to visit from far and near. The dirt road to the chapel from the south passed right between the house and barn on the Theis farmstead. Herb's Aunt Mary Theis (Sister Cassia O.S.B.) told stories of people praying the rosary on their way to the chapel so loud that their voices reverberated in the woods. Aunt Mary and Uncle Frank Theis, as children, would often accompany their Grandmother Elizabeth on her journey to and from the chapel to pray. June 28th, 1894 was a hot, sultry day on the farm. It was mid afternoon when the sky turned black and it was soon apparent that a powerful storm was brewing. The Theis family had all collected at the house for protection from the storm. As weather turned for the worst, the entire family headed for the cellar. Great-Grandma Elizabeth was too old and frail to make her way down the steep steps to the basement. Instead, she remained on the main floor looking out the door watching the storm. As she peered through the black and driving rain, her eyes suddenly caught the outline of a grey funnel coming across the field just south of the barn. Elizabeth struggled to shut the door against the blowing wind as she realized the tornado was headed straight for the farmstead. The next few moments seemed like an enternity for the Theis family. When it was finally over, Great-Grandma, the house and the rest of the family still huddled together in the cellar, were spared by the storm. Elizabeth cautiously opened the door and she gasped as she looked out toward the barn, just a stones throw away from the house. The barn had totally disappeared from the face of the earth. The storm moved on to deliver multiple tornados that day as it traveled north. It destroyed the Grasshopper Chapel, the John Fuchs farmstead just across the Sauk River and did extensive damage to buildings as far north as St. John's University about 10 miles away. 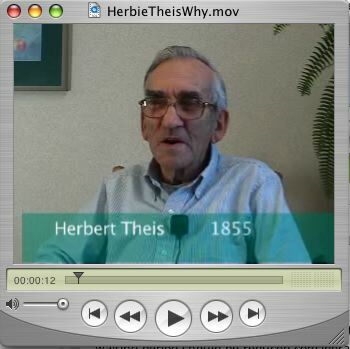 Herbert Theis was born in 1924 on the Theis family homestead in the same house his father Jacob Theis was born. Growing up in a strong Christian family, by age 16, Herb had already decided he wanted to become a priest. He traveled to the monastery at St. John's University where he was told to return to the family farm and to care for his mother and father. Priests, evidently, were in plentiful supply at the time. Herb never married and took care of his folks and the family farm all of his life. Herb farmed 76 acres with his father using machinery drawn by draft horses until 1947 when they purchased their first tractor. In 1950 Herb wired the farmhouse and barn for electricity. The farmhouse never did get running water or an indoor toilet to this day. Herb eventually took on odd jobs off the farm to supplement his income and became known as the "town handyman". From appliance and machinery repair, to plowing gardens and painting houses, Herb had a talent for doing the odd jobs well. In 1969, Herb sold all of the family farm land except the 5 acres where the original homestead buildings still reside. Over the years Herb, more fondly known as "Herbie" throughout Cold Spring, found many ways to volunteer and give back to his community. He worked with youth ministry at church, was a cub master and scout leader, and served as Wakefield Township treasurer for over 40 years. On weekends, Herb would visit local prisons and would council residents to discover and develop their spiritual lives. "I think the most important thing in life is to have a good relationship with your creator" said Herbert Theis. They called it the "Grasshopper Chapel" because it was originally built in honor of the Virgin Mary stopping the grasshopper plague that hit the area and ravaged all the crops and plants. that is a great story, but why did they call it grasshopper chapel?